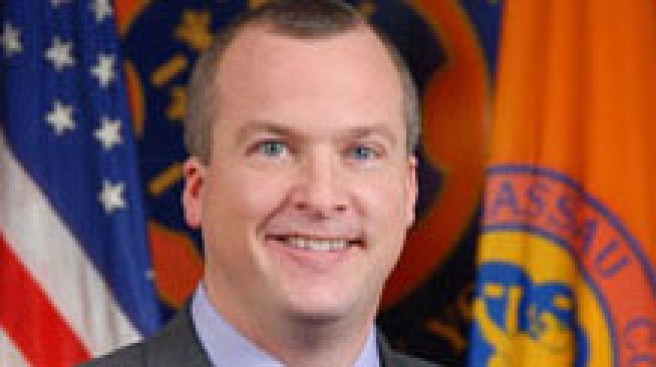 A former aide to former Nassau County Executive Edward Mangano has been indicted on charges of obstruction of justice and lying to the FBI weeks before his one-time boss heads to trial for corruption, authorities said. A federal indictment unsealed Thursday says Richard “Rob” Walker attempted to obstruct a grand jury investigation and made false statements to the FBI. Walker surrendered to federal authorities Thursday morning in Central Islip, an FBI spokesperson told NBC 4. At a court appearance in the afternoon, he pleaded not guilty and was released on a $200,000 bond. He is due back in court on May 12. Federal authorities allege Walker accepted $5,000 from a Nassau County contractor while he was Chief Deputy Nassau County Executive in 2014. They say that when Walker learned about a federal corruption probe into Nassau County government, he tried to convince the contractor to hide evidence of the $5,000 payment from a grand jury. Nassau County Executive Ed Mangano, his wife and Oyster Bay Town Supervisor John Venditto have been indicted on corruption-related counts for allegedly accepting bribes and kickbacks from local businessmen -- including a no-show job for Mangano's wife where she made more than $450,000 as a "food taster," federal authorities said. Greg Cergol reports. Authorities say Walker then met the contractor in a Hicksville park to return the $5,000. At the meeting, which was surveilled by the FBI, Walker allegedly handed the contractor an envelope containing $5,000. When questioned by the FBI about the money, authorities say Walker denied ever receiving the payment from the contractor. “We will withhold comment, for now,” Walker’s attorney, Brian Griffin, told Newsday Thursday. Before working as an aide to Mangano, Walker was a state Republican assemblyman. Walker’s arrest comes weeks before the start of the corruption trial of Mangano, his wife, Linda Mangano, and Oyster Bay Town Supervisor John Venditto. Ed Mangano and Venditto face corruption-related charges including fraud and conspiracy for allegedly accepting bribes and kickbacks from local businessmen, while Linda Mangano is accused of making false statements. All three have pleaded not guilty.